9 March 2017. 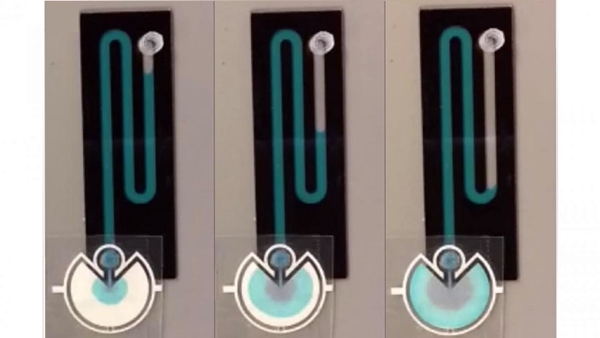 An engineering lab developed an inexpensive pump without electric power for lab-on-a-chip devices, making these systems more portable for diagnostics. Researchers from a joint biomedical engineering lab at North Carolina State University and University of North Carolina describe the pumps in an article published in late February 2017 in the journal World Scientific Technology (free registration required). The pumps are the work of the lab in Raleigh led by biomedical engineering professor Glenn Walker that studies microfluidic, or lab-on-a-chip devices for testing and patient monitoring. Among the devices in development by Walker and colleagues are chips to replicate the microenvironment or support system for cancerous tumors, and monitor parathyroid hormone levels among people with overactive thyroid glands. Microfluidic devices, however, require fluids to be pumped through the fine microchannels in their chips, which today also require power sources and control functions. Providing power is only part of the problem. Pumping systems on microfluidic devices also need to start, stop, and adjust their flow rates on demand. The Carolina team calls its solution for these functions an hydraulic battery, another name for the capillary action of water through paper, where fluids such as blood are drawn into minute empty pores by their surface tension. In the team’s microfluidic pumps, the pores are 125 microns across, where 1 micron equals 1 millionth of a meter. Control functions are designed or programmed into the paper. Two-dimensional pores make it possible to turn pumps off and on by attaching or detaching the paper to the chip. But more complex functions can be programmed with three-dimensional designs, where individual paper pumps are stacked and integrated. In their paper, the team demonstrates various control functions of flow rates, including step changes, as well as ramping and oscillating flows. The researchers designed the paper pump as an attachment to microfluidic chips, with its low cost as a highly desirable feature. The pump is made from commercial chromatography paper used to separate chemical components in the lab, with the sheets laminated to prevent evaporation. The team estimates those materials cost about $0.07 per pump. The low cost means it’s disposable, but its detachable nature also makes it possible to save the fluid sample in the paper for analysis later on.